UK environment minister Elliot Morley has asked leading industrial nations to support a plan for storing carbon dioxide under the sea bed. Ministers believe the plan - known as carbon sequestration - has become increasingly important in light of warnings about global warming. Disused oil and gas fields could be used to store the greenhouse gas. Mr Morley outlined the proposals on Monday at a meeting of leading industrial nations in London. The government's chief scientific adviser Sir David King has made repeated warnings about a possible surge in global warming. There are also fears that man-made CO2 is making the seas more acidic - which could threaten plankton and coral reefs. However, many environmental groups are opposed to the scheme, viewing sequestration as a diversion from the real task of tackling greenhouse emissions from the burning of fossil fuels. But Mr Morley told the Independent on Sunday newspaper: "Our priority is to reduce emissions but, as an interim move, carbon sequestration is an option we should be exploring. "If we are to move ahead with this option, we need to involve the international community, particularly to ensure we can be satisfied that it has proper safeguards built in for the marine environment." If other governments provide their backing, Mr Morley will ask for a series of working parties to be set up in order to test the scheme's feasibility and address fears the gas will leak out. 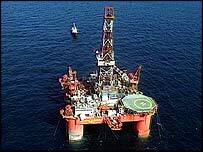 Carbon sequestration is already under investigation in the North Sea by Norway and by the US. Experts who back the technique say the UK could store all its carbon emissions for more than 100 years in exhausted oil and gas fields in the North Sea. The UK minister discussed the plan at a meeting of governments to discuss a major international treaty which bans the dumping of waste in the marine environment - the London Convention, set up in 1972.